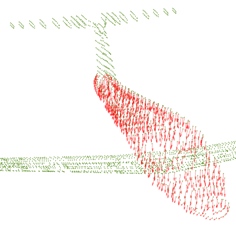 Aircraft loads are the basis for all structural analysis and certification work. Aircraft development programs require accurate design loads soon after project start to avoid potential costly rework and schedule delays. Aerosciences loads engineers have developed techniques and methods which quickly create loads for preliminary design use. As the design nears production configuration, final design and fatigue loads are created and documented in certification reports for our clients. Aerosciences methods include the use of wind-tunnel and flight test data, Vortex-Lattice and Vortex-Doublet Models, and published aerodynamic data. We also utilize specialized computer programs which determine balanced aero and inertia load distributions for the overall aircraft. These programs include time history response analysis for FAR 23/25 maneuvers, gusts, and landing conditions, as well as corrections for the effects due to Mach number and aeroelasticity. Critical load cases are identified and corresponding nodal point loads are created for direct application to Finite Element Models used in structural analysis. Additional capabilities include dynamic gust loads using the NX Nastran Aeroelastics module. Design loads for rapid decompression and for landing impact may also be created using additional specialized computer programs.